SCE Meteorologists Nicholas Sette (left) and Paul Roller, look over some weather charts as they prepare their El Niño and other weather forecasts. SCE’s Meteorologists Nicholas Sette (left) and Paul Roller have been working with the company-wide El Niño Preparedness team to help with plans for the upcoming rain season. Unusually warm sea surface temperatures in the equatorial Pacific Ocean, shown in this November map in red, are typical of an El Niño. Warm El Niño waters in the equatorial Pacific are expected to displace warm waters to the north, dubbed by National Weather Service Forecasters as “Blobs,” to allow storms into California this year. 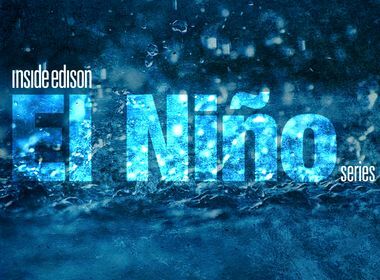 This is one in a series of stories on how Southern California Edison is preparing for El Niño​ and the 2015-16 storm season. Nicholas Sette and Paul Roller have stocked up on flashlights and fresh batteries and packed in provisions for both their homes and their cars. Sette cleaned the gutters on the house and checked the flashing on the roof. Roller made sure nothing is blocking the drainage around his hillside home. These are smart preparations for any emergency, but this duo’s actions take on particular significance this year. Sette and Roller are Southern California Edison’s meteorologists and they are taking to heart everything their maps and their models are telling them about the predicted “Godzilla El Niño" this year. “By some measures, this already is the strongest El Niño in history,” said Sette. Typically, the two meteorologists spend their days supporting SCE’s traders — the people who buy power for the company on the commodity market — and keeping key company personnel aware of upcoming weather conditions that might affect operations. But with the latest climate data pointing to a 70 percent likelihood of higher-than-normal rain this winter, the meteorologists are taking a key role on SCE’s companywide El Niño preparedness team. The SCE El Niño team has been working since summer to identify potential vulnerabilities to the power system so they can be shored up in advance of the worst of the weather, which is expected to hit Southern California from January to March. New modeling technology that wasn’t available in the 1997-98 El Niño is helping the meteorologists better hone their forecasts. “We have high-resolution weather models that give us more detail for what areas will have the most extreme weather,” Sette said. They are taking that information and comparing it with historical data going back to 1998 to map out when and where storms are likely to pose problems in SCE’s 50,000-square-mile service territory. Based on the 1998 El Niño, the rain could be substantial. In February 1998, downtown Los Angeles recorded 13.68 inches of rain for the month, just under the city’s 14.81 average for an entire rain season. Sette projects that with a strong El Niño this year, there could be a 190-percent increase in half-inch rain days at Los Angeles International Airport alone and a 600-percent increase in 1.25-inch days. “We didn’t have any 1.25-inch days at LAX last year,” Sette said. “I expect to have seven if there’s a strong El Niño — that’s a lot of rain.” Hillside areas and those prone to flooding could see even more rain. The meteorologists are hoping to be able to refine their forecasts three days in advance to more accurately predict the path and likely severity of any storms to give company crews time to prepare. “We want to get on top of things and get people’s attention to make them aware something is coming,” Sette said. Although this year’s El Niño could bring disastrous weather, Sette said he can’t help being a little excited about it. “I’ve been here four years and have barely even seen it rain,” said the New Jersey transplant. Caulk leaky windows to prevent wood rot and mold. Repair concrete and stucco which can be damaged by water seeping through cracks. Get your roof inspected and repair any potential problems. If you have drought-tolerant plants surrounded by lightweight mulch, you may want to sandbag your yard on the downward side to prevent the mulch from being carried away by swift water and clogging the storm drains in your area.